I am happy to release a small tool and its source code which can be helpful in testing and tuning Red5. This software release contains a client swf application which can broadcast and receive video/audio streams and also an extremely simple server side application. The client swf application can be used by itself with the popular Red5 demos (aka oflaDemo, simpleBroadcaster, simpleSubscriber) as long as you know the stream names and set them properly in the configuration file. If you install the server application, it will allow you to see the round trip delay for netConnection calls. Make sure to open up the config\DelayTestConfig.xml file and set the correct server/stream information. You'll see that there are also a bunch of entries that let you specify the camera parameters. The clock offset isnt important. The poll rate parameters are how often the stream information dialogs are updated. On each client computer you want to use the application on, you will have to allow flash to load files from the systems local drive (the xml config file). 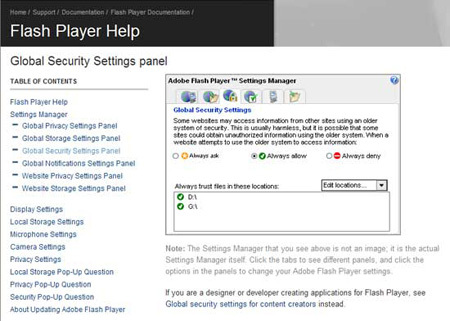 In order to do this, you have to go to the flash player global security settings (yes, its an online flash app): http://www.macromedia.com/support/documentation/en/flashplayer/help/settings_manager04.html And under "Always trust files in these locations", just add the root directory of the local computer. If for some reason the stream boxes don't show up inside the application, its because it was unable to load the xml file; most likely from the security settings I explained above. Open up the delayTestClient.swf file in a browser or standalone flash player and you should see a whole bunch of boxes. The boxes on the right are for starting the broadcast of your video and audio. Boxes on the left will allow you to receive a video and audio stream. You should be able to start broadcasting/recieving if the entries in the config file were correct. The "NetConnection Call" operations are for calling a function on the Red5 server over and over again. The server returns values to the client application, and the delay is calculated based on the send and receive times. 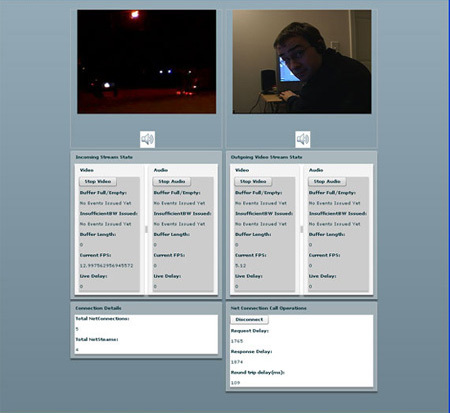 Each box also tells a whole bunch of information about the specific video stream. Is it possible that the Scope delayTest is not found on running the application ? You'll need to look in the client application then go to bin/config and edit DelayTestConfig.xml to match up with your media server. You can then use that file to test out different camera and microphone settings. A long time ago when I wrote this I was primarily looking at the netconnection call round trip times. An alternative to this would potentially be to use the publishing application that comes with Red5. Great article! And your application is great help as well. Had a quick question. What do I need to do to tell the application to stream my live video? I am basically trying to tune a red5 instance for video chat. Thanks in advance!